Standard, Specialty And Custom Sizes. Most of our mattresses can be made to order in any size. Common sizes are listed in the chart. 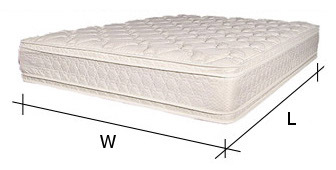 Built-to-order custom size mattresses or boxpsrings to any size. Click the button below to see prices for any size. 38 in. x 74 in. 38 in. x 79 in. 54 in. x 74 in. 60 in. x 79 in. 76 in. x 79 in. 38 in. x 80 in. 39 in. x 84 in. 76 in. x 84 in. 72 in. x 90 in. 25-34 in. x 52-74 in. 25-34 in. x 72-82 in. 30-40 in. x 74-84 in. 54 in. x 79 in. 66 in. x 79 in. 48 in. x 74 in. 30 in. x 74 in. 33 in. x 74 in. 36 in. x 74 in. 34 in. x 74 in. 49 in. x 74 in. 60 in. x 74 in. 72 in. x 80 in. 46 in. x 82 in. 58 in. x 82 in. 70 in. x 82 in. 39 in. x 72 in. 53 in. x 72 in. 39 in. x 75 in. (2) 27 in. x 75 in. (2) 30 in. x 79 in. (2) 38 in. x 79 in.